Everyday Grace by Jessica Thompson is a relationship book that focuses on our relationship with Christ as the key to dealing with our relationships with other people. 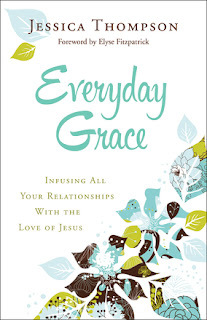 Like most "self help" books, Everyday Grace offers advice for relationships with parents, children, spouses, friends, and co-workers. However, Jessica states that unlike many of these books, Everyday Grace does not offer a "how to" for fixing these relationships. She states that help of this sort might offer a temporary improvement, but without a true understanding of the grace of God, those "fixes" will be fleeting. Instead, she details the gift God gives us through grace, and with scriptural examples, she shows how to apply that grace to our interactions with others. I find the book to be somewhat repetitive and even tedious at times, and lacking in maturity and experience. However, the author clearly shows that she is also on a journey towards grace, and she does a good job of providing real life examples that demonstrate this. I think these qualities make Everyday Grace worthwhile reading, especially for younger wives and mothers. As a whole, Everyday Grace has some excellent points--consistently pointing readers to God as the source of healing relationships, rather than our own ability to follow a set of guidelines to "fix" them on our own.